OnMessage is proud to sponsor the education series providing DFW business leaders with the knowledge they need to navigate changes in the B2B customer experience. OnMessage, a messaging infusion company, today announced it is sponsoring the “Future of the CMO & CXP Executive Education Series.” Ten 90-minute education sessions will take place at exclusive ClubCorp country clubs across the DFW Metroplex and provide executives with the actionable information they need to improve their company’s customer experience. By participating in this education series, executives will gain invaluable knowledge and insights into marketing’s role in the customer experience. Each session will provide participants with actionable information to formulate and implement strategic marketing and customer experience initiatives across B2B organizations. According to a recent report from The Economist Intelligence Unit, “Over the next three-to-five years, 75 percent of marketers say they will be responsible for the end-to-end customer experience.” For this to happen, CMOs and business executives must change the way they think about marketing. They must reset the boundaries and expand how far marketing can reach into the customer experience. The days of marketing’s sole focus on brand awareness, converting leads and launching campaigns are gone. They have been replaced with holistic ownership of the customer journey. That means the way executives across the enterprise view marketing, how it operates and the degree of influence it has on the customer experience must be completely reimagined. This series is specifically designed to provide executives with the knowledge they need to be successful in the new age of the customer. The Future of the CMO & CXP Executive Education Series occurs monthly at convenient locations across the DFW Metroplex. Each 90-minute session is from 11:30 a.m. to 1:00 p.m. and includes lunch. The course curriculum provides participants with the perfect combination of market research, educational insights and peer-to-peer-learning opportunities. 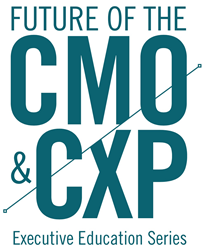 A complete “Future of the CMO & CXP Executive Education Series” Curriculum Guide can be downloaded at http://cmoeducationseries.com/CurriculumGuide.pdf and executives can register at http://www.cmoeducationseries.com. OnMessage is a messaging infusion company with a proven model for helping organizations develop a clear, compelling and consistent corporate message throughout the customer experience. The company’s methodology aligns an organization’s strengths and true points of difference with customer needs to create a messaging platform that elicits optimal engagement. This methodology, when combined with the company’s organizational change, sales enablement, content development and brand integration services, enables companies to achieve a higher return on every connection they make. To learn more about OnMessage visit http://www.itsonmessage.com.